There were no incidents at the tightly guarded airfield, but police said a man and a woman were arrested in Sydney while trying to display a banner on the Harbour Bridge. The flame has become the focus of international demonstrations against China's role in Tibet and the Olympic host's human rights record. "Two people, a man and a woman, were detained by security officers as they tried to unfurl a banner on the bridge," a police spokeswoman said. 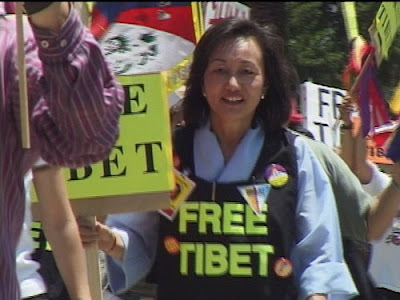 There were reports the pair had planned to unveil a Tibetan flag, but the spokeswoman said she could not confirm that. Overnight, a laser light display was used to project the slogans "Don't torch Tibet" and "One Dream: Peace in Tibet" onto one of the bridge's pylons. Paul Bourke from the Australia Tibet Council said the display was designed to protest a plan to carry the Olympic torch through Tibet, saying it had nothing to do with sport. "It is a blatant political manoeuvre by the Chinese leadership to symbolically cement and legitimise their control over the region," he said.